I am not nearly so frustrated with my black oil sunflower seed-addicted bruin neighbor as I was after his little escapade last Friday morning around 2 a.m. I was trying to finish some writing before I left for my pre-dawn “day job” when I heard some noise on the deck. I had chased a raccoon away the night before and figured it was back. But the noise had a little more substance to it. Bear! I thought. We had had one a couple of months ago that had come on the deck and taken a full can of black oil sunflower seeds in it’s mouth and sauntered off into the yard. I went out and yelled at it and it ran into the woods leaving the bird food behind. We brought all the food and feeders in every evening for about a week afterwards and it appeared that buddy bear had forgotten about our buffet. But last Friday he was back – I’m assuming it was the same bear and I’m assuming it’s a “he” because it is solo. I figure a female would have cubs in tow. And, as if remembering what happened last time, Buddy didn’t waste time in the yard – just snatched the can of seed and hi-tailed it for the woods. I made a quick search around the perimeter of the yard – no can and no bear to be seen. So, I headed off to work. The next morning Denise walked out into the woods along a dim trail that follows the creek that cuts across our property. She discovered the birdseed can along the trail about 200 feet or so into the woods. Buddy had not mashed or mangled anything. It looked like he just helped himself to about 10 pounds of black oil sunflower seed and staggered off into the woods to sleep it off. He even left the scooper, undamaged, in the can. So we are, once again, left with bringing seed and feeders in every evening and putting them back out every morning. And every evening and every morning I’m grumbling about that “damn” bear. Well, yesterday I was working in the yard, doing some weed eating and burning some debris. I scooped a pile of limbs from a stack that had been established earlier in the spring and felt that hot sharp pain on my hand that only means one thing – yellow jacket. It has been a banner year for yellow jackets in my yard. I know of at least four nests. And while I don’t go out of the way to destroy nests, if they are in heavily trafficked areas they have to go. The sting reminded me of a nest I had seen near the garden and I decided to go over and check on it. When I got to a place where I could see where the nest was, I could see exposed dirt. I approached closer and the nest was gone. 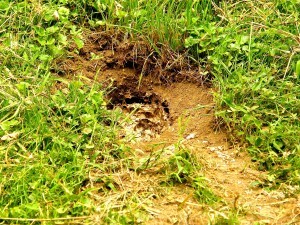 The dirt in front looked like it had been moved by a tiny excavator – a cut about 8 – 10 inches wide and 12 – 18 inches long – revealing the empty bottom portion of the yellow jackets’ paper nest – all the juicy larvae gone. These larvae are a Nirvana of fat and protein and bears seem to think the trade off in stings is well worth it. 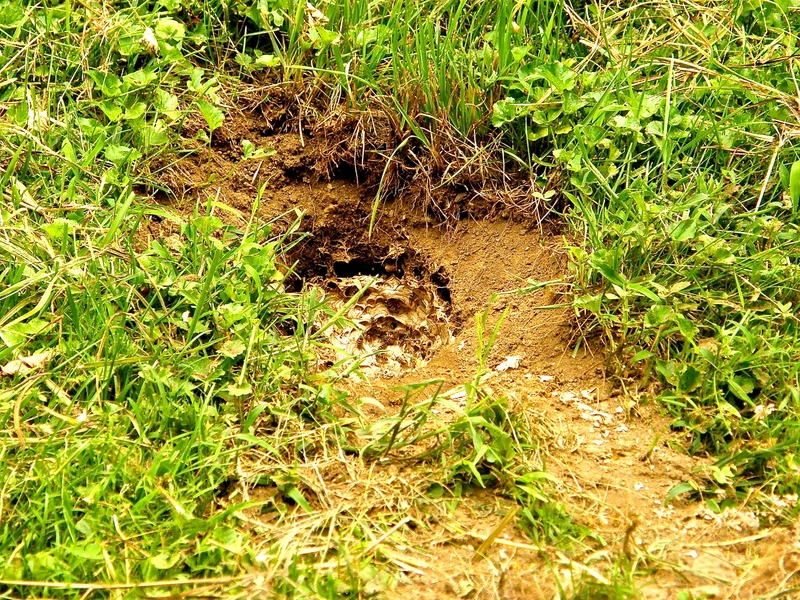 Other animals, like raccoons and skunks will also dig up yellow jacket nests. But this nest was gone in one fell swoop – no little paws digging around; no pieces of nest scattered about – I am confident this was Buddy’s handiwork. I will continue to bring the birdseed in but it’s okay with me if Buddy wants to patrol for yellow jacket nests at night. Good to hear; too bad he had not smelled the nest in the brush pile first! Really enjoyed this piece – thanks. Yeah! Could’ve saved a painful hand!